I have quite a small make-up collection but every item that is in my make-up bag I tend to use on a regular basis because I hate the idea of wasting money and products! So here is my entire make-up collection. 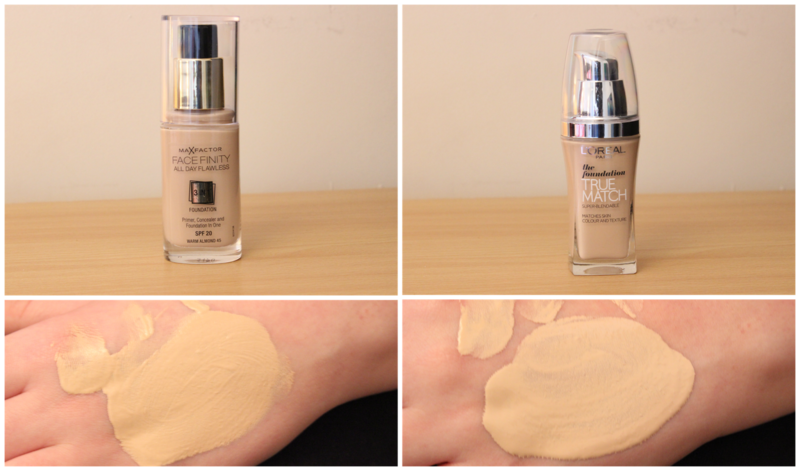 I only use an eye primer as the foundation I tend to use is also a primer, the eye primer I use is MUA’s Pro-Base Eye Primer which is the first eye primer I have ever tried and I must say that I am loving the results. However I have noticed that when you’re getting to the end of the product it turns really thick and goes onto the eyes a little uneven no matter how well you try to smooth it out. Up until recently I never really bothered with my brows but one day I was following a tutorial and I noticed how much of a difference there was with having filled in eyebrows! 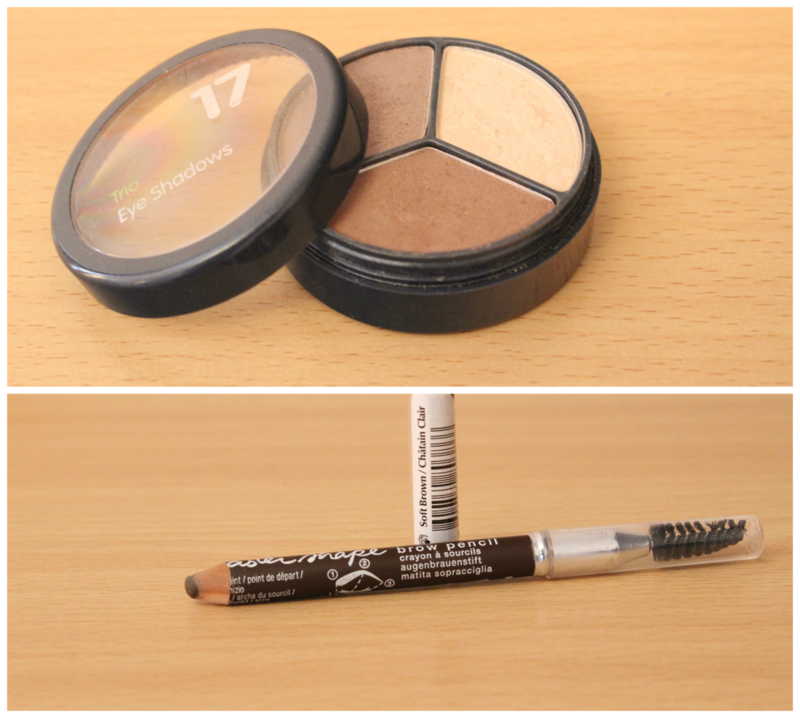 I use two methods, the 17 Trio Eyeshadows when I want more of a softer look and the Maybelline Master Brow Pencil when I want my eyebrows to look sharp and defined. I have quite the collection when it comes to eyeshadows, mostly palettes however they are incredibly useful when I’m travelling because it means that I don’t have to take a tonne of separate eyeshadows and fill up my make-up bag. 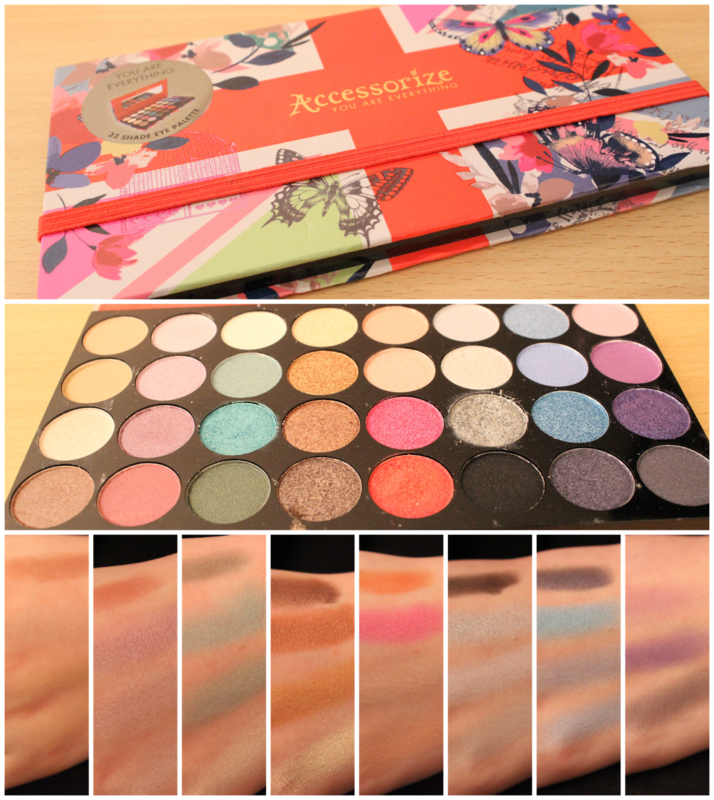 My all time favourite has to be the Accessorize ‘You Are Everything’ palette because there’s a range of different colours and textures from shimmer to matte which makes this a go-to palette for me because I can just play around with a load of different looks by using just one palette! The Beauty UK palette I only use the black to line my upper lash line because it is such an intense black and lasts really well, as for the rest of the colours I use them for Halloween looks and I used it on Steve this year as he was a zombie. MUA’s ‘Heaven and Earth’ palette is a very close first because I love all the neutrals in this palette and they all have a little bit of shimmer but it’s not so over the top that it makes your eyes look like a glitter ball! I received this is a gift from Steve’s sister and I don’t think I have used a single pot eyeshadow so much! In the pot it looks purple but as you smoke it out it turns into more of a dark red/brown (I’ve tried to show you the best as I can in the picture!) the only problem is because it’s not a pressed eyeshadow it can get a little messy so you really do have to get rid of any excess off of your brush or you’ll be in fallout mania! Eyeliner is the one thing that I cannot walk out of the house without doing! It just makes me look a lot more awake and my lashes a lot thicker! I never line my lower waterline only the top because it never stays and it just smudges to make me look like I’ve been crying for the past hour! I tight line by using my Colour Trend Black Eyeliner Pencil which I have had for nearly 3 years and there is still loads left and I have used eyeliner every day! 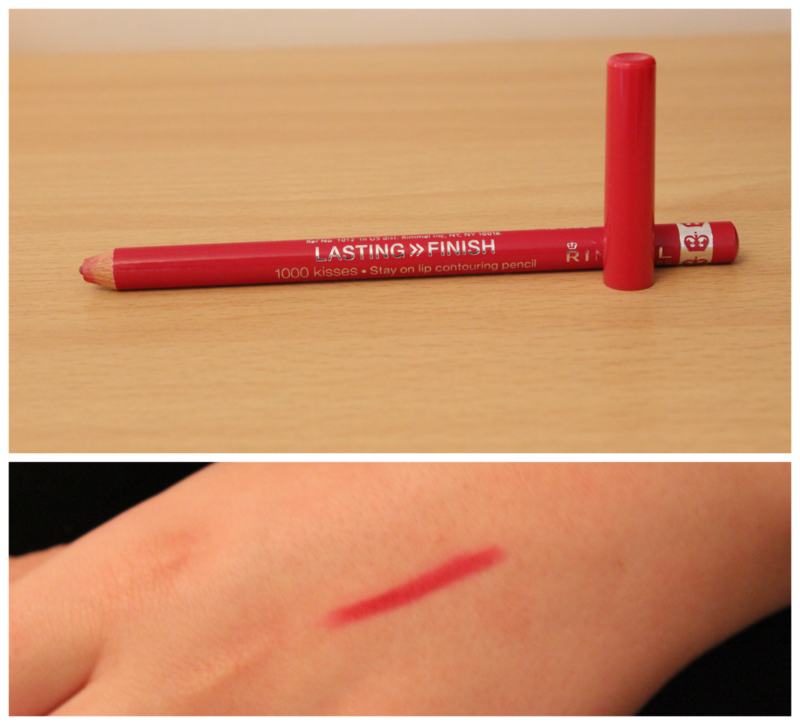 It’s insane, however, it’s the best eyeliner pencil I have ever used. It lasts all day without ending up all around my eyes, unlike most pencils I have tried. 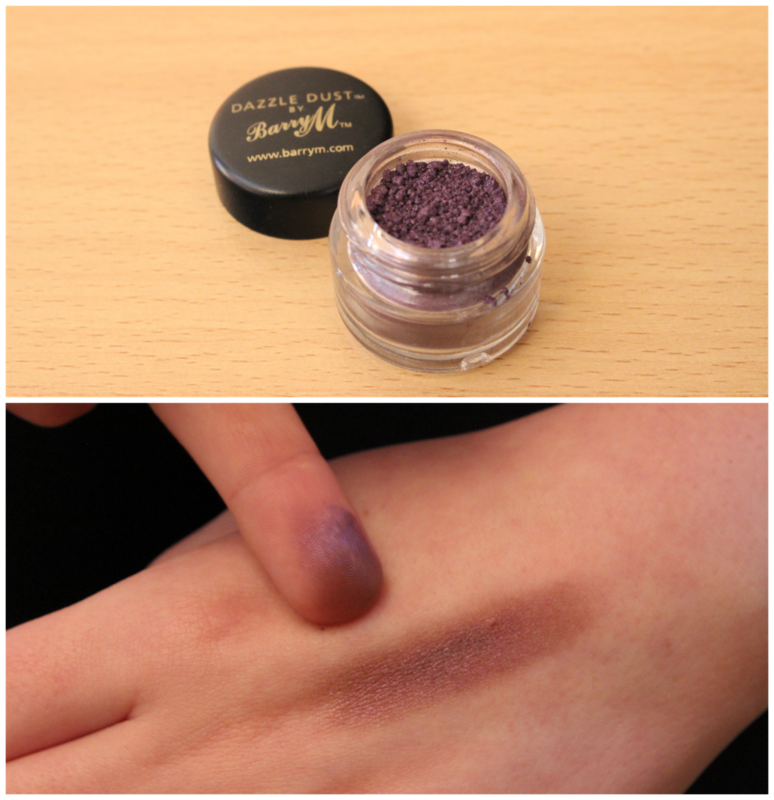 As for lining my upper lash line, I used to use black eyeshadow until I felt brave enough to give gel eyeliners a go! 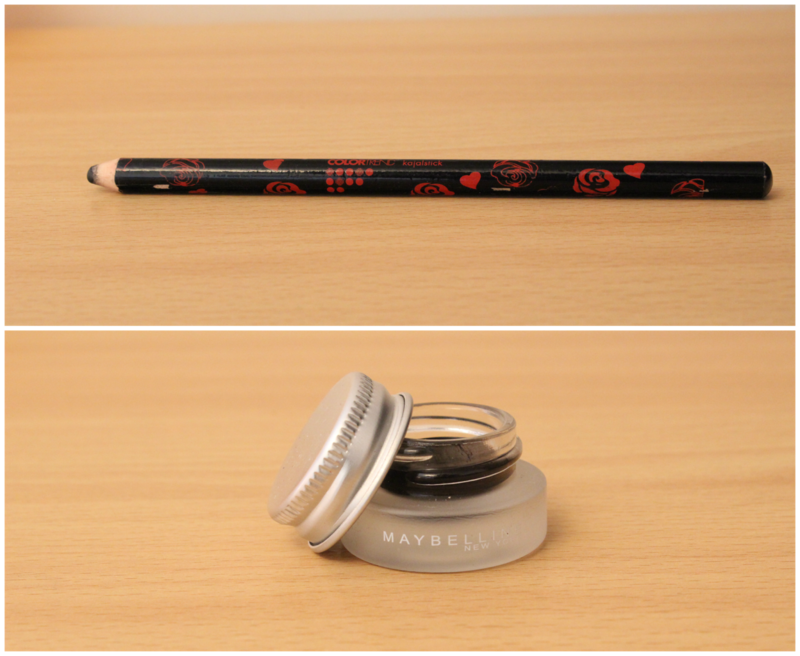 I had the most horrible experiences with liquid liners so I thought gel would be a happy medium and the one I have fallen in love with is the Maybelline Eye Studio Gel Eyeliner in black. I didn’t have a proper eyeliner brush until recently however they give you one which I thought is a nice little extra and it’s not an awful brush, to be honest. Yet another thing that I need to look human and it seems that I have a fair few! 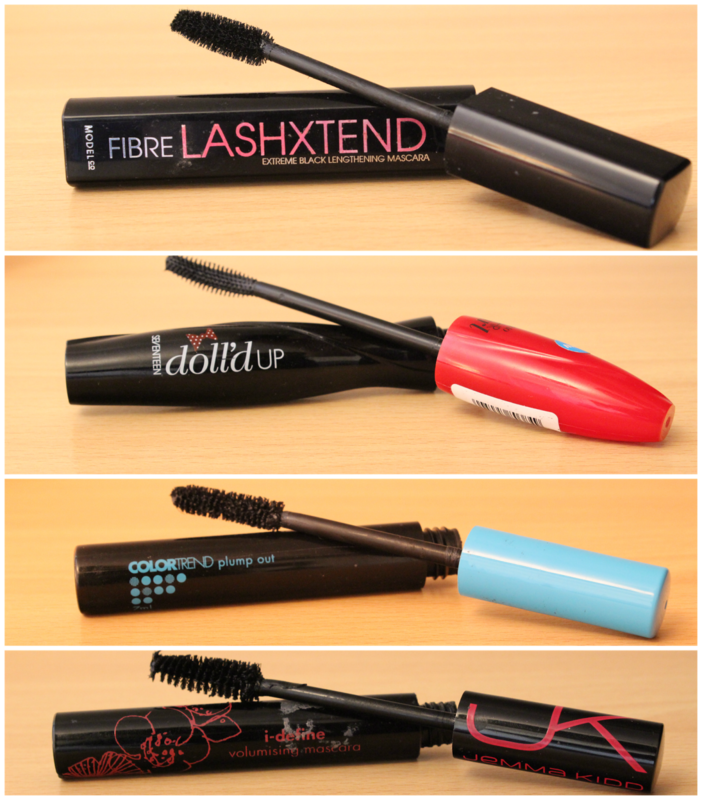 My all time favourite is the ModelCo Fibre Lashxtend Mascara as it gives my lashes a lot of lengths and a little bit of volume without making them all clump together. I am also quite fond of the Seventeen Doll’d up Mascara (click here for a full review) which is a curling and volumising mascara which also doesn’t clump my lashes together, the only quibble I do have with it is the wand as it is plastic and quite sharp! Coming up third is the Colour Trend Plump Out Mascara, this was a great mascara when it was new however it’s starting to dry out and go clumpy so I end up with fat spider leg lashes with knobbly knees! Last but not least the Jemma Kidd I-Define Mascara THIS IS AWFUL!! It’s clumpy, smell absolutely vile and I’m glad I didn’t pay for it! It was a freebie in a magazine. No wonder it was discontinued! 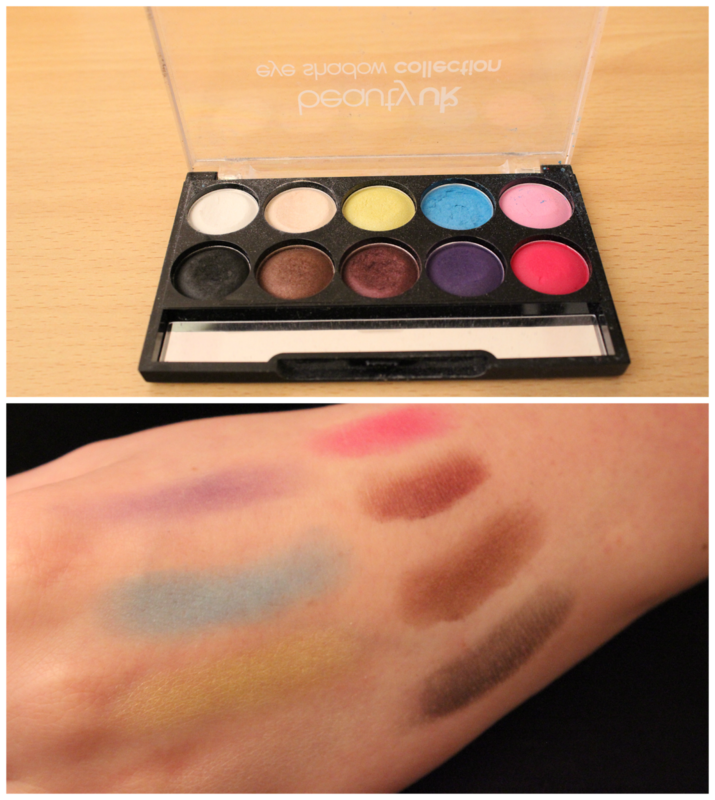 MUA Shade 13 (£1.00) Look in-store! 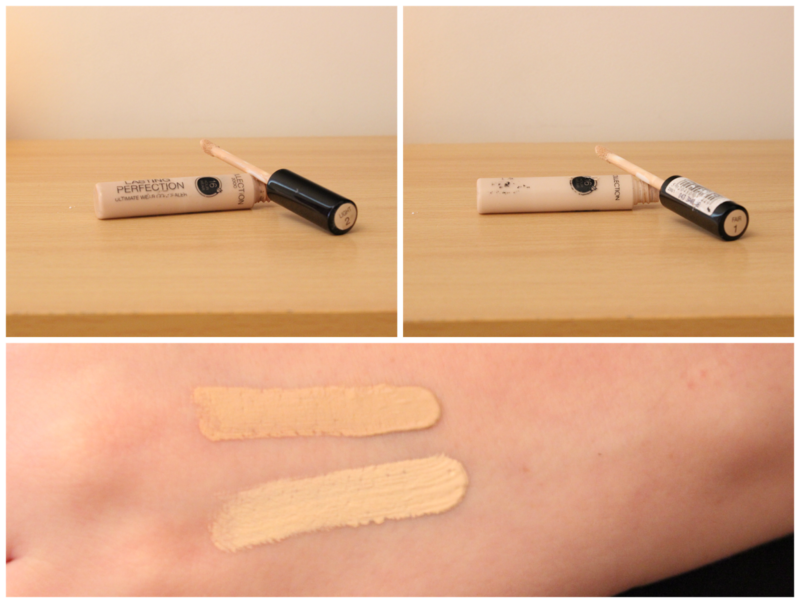 MUA Shade 1 (£1.00) Look in-store! Can you tell that I like my red/pink lip products?! So let’s start with my lipsticks, I am planning on getting more lipsticks however I need someone to be there with me for their opinion other than Steve, bless him he tries to help but he just nods and hopes for the best! 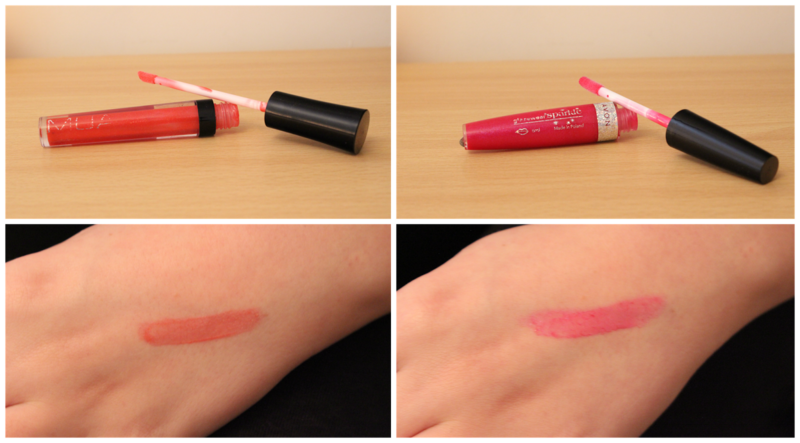 Rimmel’s Kate Matte Lipstick 107 is the one that gets worn most in Autumn/Winter, simply because I think it’s such a festive looking red both in the tube and on the lips, granted you have to have well-moisturised lips to wear this or every little bit of chapped skin will be highlighted! 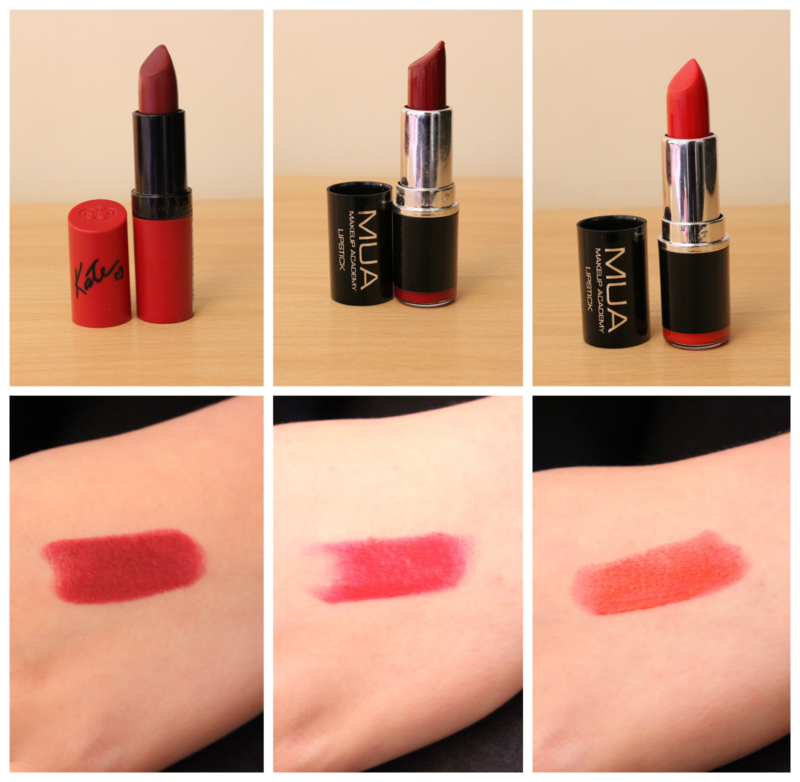 Onto the MUA Lipsticks for just £1 they are surprisingly long lasting and moisturising, so I need to get a few more me thinks! I don’t use lip glosses as much as lipsticks because I’m not too keen on the ‘super shiny lips’ look, however, I do use the MUA Lipgloss shade 2 and the Avon Glazewear Shimmering Amethyst occasionally. Last but not least, lip liners! I only own the one and I love it! I never bothered with liners until recently when I was trying to pick something on a 3for2 offer and I thought I’d try something new. Although I need to buy a sharpener for it so I can start using it again! 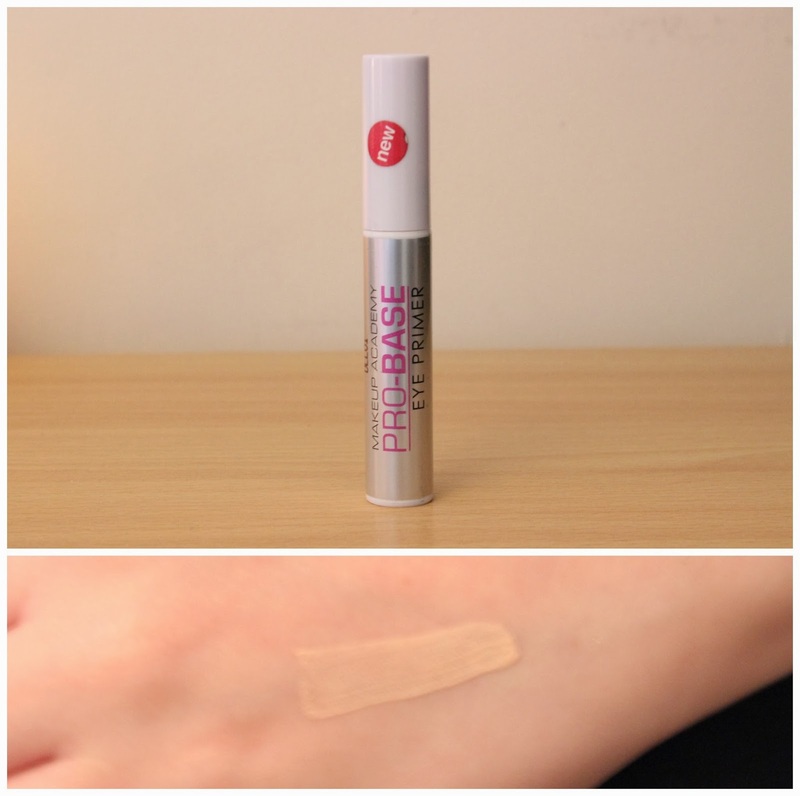 I grabbed this within the first week of its ‘launch’ and I do love it however if you don’t powder on top then you’ll end up looking a bit oily, which isn’t the best of looks! Other than that it does keep your makeup in place for the whole day. I don’t have a lot of makeup because I feel that I am still in the beginning stages of exploring the world of makeup and it’s techniques. I have kept to the basics for the past 2 years and I’m not feeling brave enough to venture out of the drugstore beauty section quite yet! I will be doing individual reviews for each product mentioned and any reviews that are already available I have listed them.